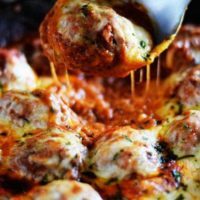 Cheesy Skillet Meatballs in Marinara Sauce are pan fried meatballs drenched in rich saucy marinara topped with gooey melted cheesy! This meal is quick to put together and full of Italian flavor! 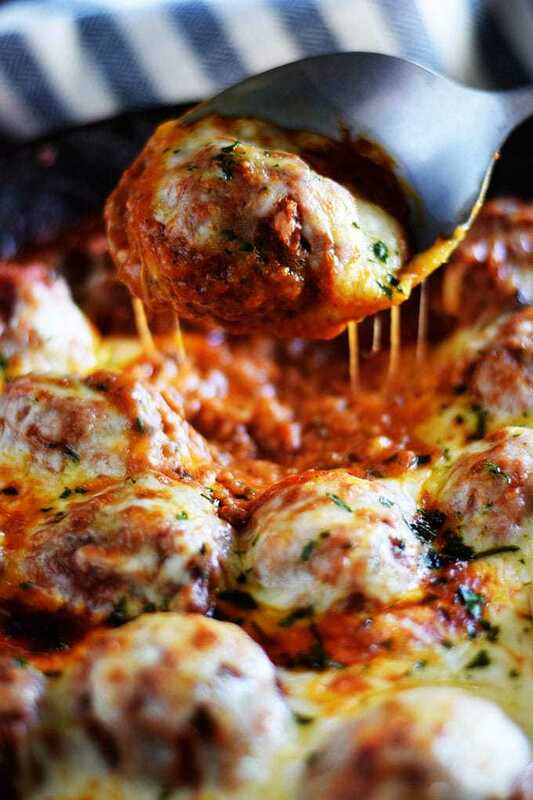 Today happens to be National Meatball Day! Hooray for a day like today! I mean who doesn’t love a juicy meatball? If you have been around the blog you already know my love for cheese and Italian food! I think they go hand in hand really! AND Meatballs!!! They can only get better drenched in Marinara sauce topped with gooey cheese melted on top! About this dish and 5 THINGS I love the most about it! There are a few! It can pose as a trusty appetizer. Or fill you up as a meal! It’s so EASY to make! 30 Minutes to cook this rich saucy dream! And that cheese! Must I remind you! Get your paper and pencil ready to jot down a few fun ways to serve this dish! Hey, if you have any leftovers, here are some great ways to eat them up! 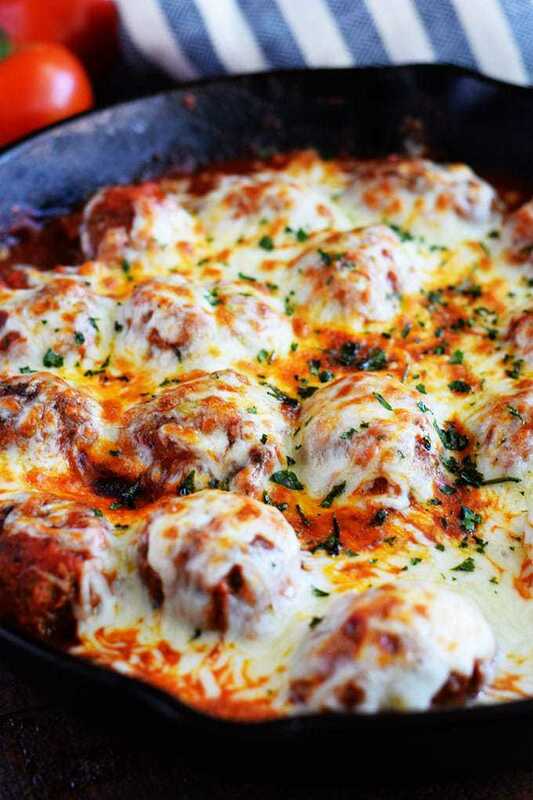 Way’s to serve Cheesy Skillet Meatballs in Marinara! Watching carbs! Over some zoodles or with a green salad! On top of pasta! Any that you like! (My fav is spaghetti and my hubby’s is angel hair pasta – we may fight over this a little). Just pour in an extra jar of sauce when making this, if you would like more for the noodles. Serve on sliced french or baguette garlic bread as a appetizer. Sometime I love to add sauteed green bell pepper slices. Make a meatball slider or go for the gusto and make a whole sub! Or just “As Is” is perfection too! One. In a bowl mix all meatball ingredients together by hand. Shape by into about 1 to 1 1/2 inch balls. You can also use an ice cream scoop. Three. Add marinara sauce and let cook for 20 minutes. Four. Sprinkle cheese on top and finish under the broiler for a minute or two. Keep an eye on them. You just want to melt cheese and give it a golden color. Garnish with parsley or basil. 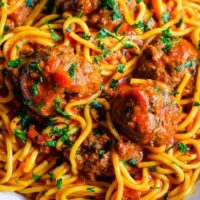 Things you may find useful for this Recipe! In a bowl mix all meatball ingredients together by hand. Shape by into about 1 to 1 1/2 inch balls. You can also use an ice cream scoop. Add marinara sauce and let cook for 20 minutes. Sprinkle cheese on top and finish under the broiler for a minute or two. Keep an eye on them. You just want to melt cheese and give it a golden color. Garnish with parsley or basil. You can use all ground beef if you prefer. 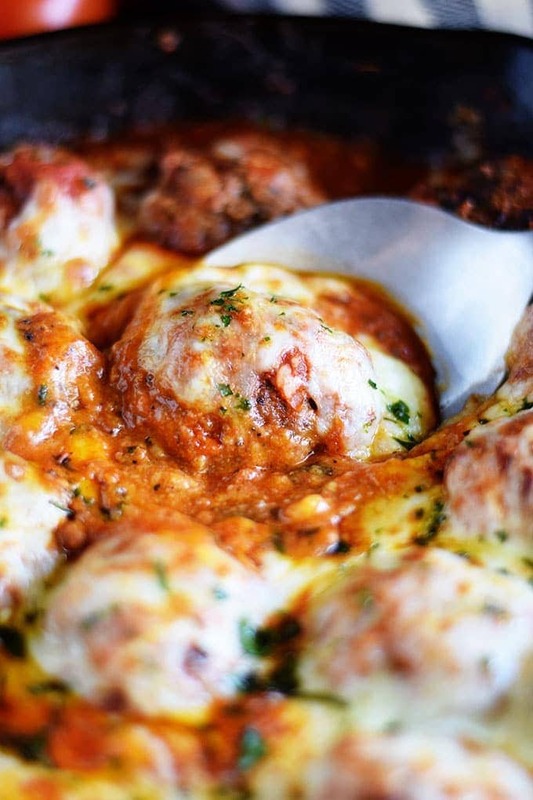 Please Pin – Cheesy Skillet Meatballs in Marinara – for later! 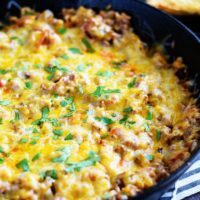 Find this over at Meal Plan Monday and Weekend Potluck! What brand/flavor do you suggest? 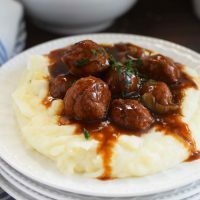 I like either Bertolli or Classico’s with made with Burgundy wine for this recipe. Looks wonderful! 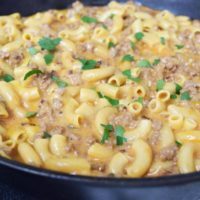 I’m sharing this in my recipe gazette today, over 100k subscribers, with a link to your post for the recipe. Thanks for sharing such a yummy one!